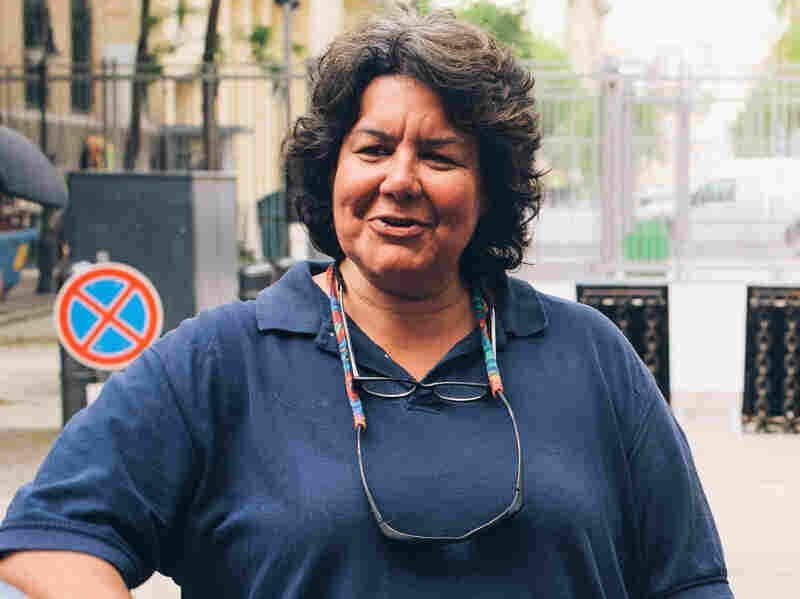 A Hollywood Animal Trainer's Secrets For Getting Dogs To Act On Cue Teresa Ann Miller often works with furry performers, but the Hungarian film White God was especially challenging. "The dogs just thought it was a party," she says of the film's dog-pack scene. Animal trainer Teresa Ann Miller is used to working with furry performers, but she says the Hungarian film White God was especially challenging. "This wasn't necessarily a film with an animal in it," Miller tells Fresh Air's Terry Gross. "It was a dog leading the film and telling the story." 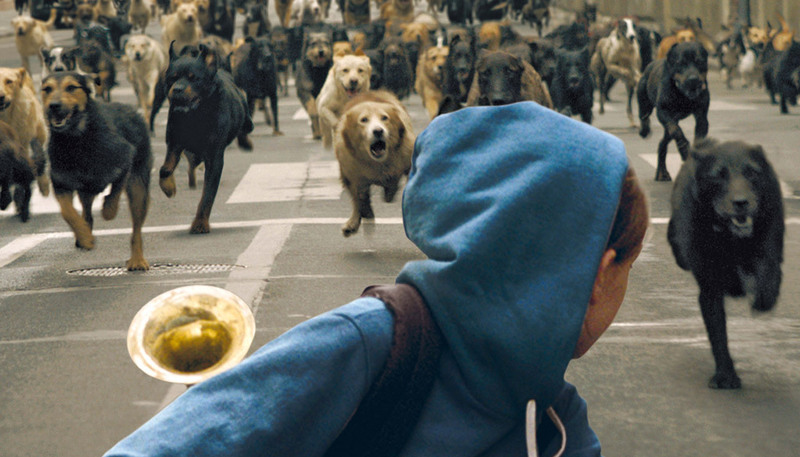 Directed by Kornél Mundruczó, White God tells the story of a mixed-breed dog, Hagen, who is abandoned alongside a highway and who then bands together with other discarded dogs to get revenge against the people who have mistreated them. Miller helped cast and train the two dogs who shared the role of Hagen. She says that casting was particularly difficult: "Kornél [Mundruczó] ... was very clear that this one lead dog had to be different than the other 250 dogs around him, mixed breeds. So there's a challenge right there to find that one-in-a-million dog; however, he needed to have a photo double just for the amount of work that was scripted ... so it was a two-in-a-million dog that we were looking for." We even had a seal in our bathtub one time overnight because my dad was working with the seal the next day. Miller's father, Karl Miller, was an animal trainer who worked on films like Beethoven and Cujo, and who frequently brought animals home with him. "It was such an experience growing up to be surrounded by so many critters," she says. "We had chickens one day, a little raccoon the next day. We even had a seal in our bathtub one time overnight because my dad was working with the seal the next day." It was actually first based on his appearance, which sometimes it is here — that's kind of Hollywood, right? ... It was appearance first, and, of course, we wanted to be sure he was great with kids. And this dog had grown up in a family with small children and what have you, so we knew he would be good with kids. And from then on the challenge was exposing him to everything. He had never been out of his front yard. He lived in a very small town in Arizona, hadn't seen very many things, hadn't seen cars in traffic. And it actually added to our experience in Budapest and added to [his] experience on film, seeing things for the first time. Animal trainer Teresa Ann Miller on the set of White God. "This wasn't necessarily a film with an animal in it," she says. "It was a dog leading the film and telling the story." Everything that the dog does is a reflection of either my body language or my tone of voice. ... In a lot of your obedience ... work you give very, very direct cues ... one-word and one-syllable commands to the dog. And you get a quick reaction to what you're asking him to do, ultimately. So you would tell him to sit, stay, come, what have you. When you're working with animals in film, what we do is we use a much more relaxed attitude, a much more relaxed and loose personality in ourselves. So I might say, "Hey, get over there and stay. No, stay, look ..." and that keeps him looking and keeps him guessing and gives him a little bit more range to be able to see what's going on around him, and yet I can keep his attention at the same time. It's all part of the training that we do, really. It takes a good couple of months to get where we're in tune that way and he knows to kind of mirror my voice and my body language. "The dogs just thought it was a party," Miller says of the pack scene in White God. "They were just running to get to the other side, because on the other side is where they'd get all their treats and goodies." They had four months to prepare it. Árpád Halász has a beautiful dog school there outside of Budapest where he teaches fly ball and obedience and all your dog sports, and so he has a lot of contacts to a lot of dog owners besides his own dogs that he trains for local movies. ... What pushed the endeavor another step was the fact that production and he made contact with the local animal shelter and actually incorporated animals from the shelter into that running pack as well. And that was amazing to see; that was fascinating. I've never seen it done. I've never seen such a large pack of dogs run together. And, quite honestly, I don't think we'd ever do it here [in the U.S.] just for the time that it takes. It's so much easier just to CGI it, but the director didn't want that effect at all. [We had the Beethoven] Saint Bernards at the house, Great Danes at the house growing up. Even stranger than that, my father did Cujo as well ... and [in the film] he gets rabies, terrorizes this whole little Western coast or what have you. ... I knew the dogs as pets and never had any qualms ... and it wasn't until I saw the movie — I was honest-to-God terrified of these dogs after seeing the movie. I just couldn't believe it. It was then scary to go in the backyard at night and see one standing there looking at you. ... That was my dad's specialty, doing the Dr. Jekyll and Mr. Hyde kind of characters. A dog is the only animal that genuinely wants your attention and your affection and praise. Working with the other animals is typically working with food reward. And it doesn't mean starve the animal; it just means, when the animal is in training, that he's learning while he's getting his breakfast, lunch and dinner. So he's not being deprived in any way, it's just that while ... he's learning he's getting his regular meals. The difference also, being on a project where I might have one or two dogs to play the role of the lead character; with a cat, you probably have four or five cats because, again, you don't have that food drive for very long. Once they get a little full, now they're not interested in working anymore ... so you bring in the second cat to try to continue your day and work out for the rest of the scene. It is quite different working with them, but you still can teach them how to retrieve, how to go from point A to point B, how to go and rub up on an actor. You've seen it in all your cat commercials or what have you, so there's quite a bit you can still teach them to do. They say, years before, if they used to do a film and the horses were running and they needed them to fall, they'd put a cable there and trip them and simply have them fall. And horses broke their legs, they broke their necks ... but it was just a horse — in their thinking, it's just a piece of livestock. ... None of that is acceptable anymore. Now they train horses to fall. It's beautiful. They train horses to fall, and the ground is soft and they have it padded and we know exactly where and when it's going to happen, and nobody is going to get hurt.